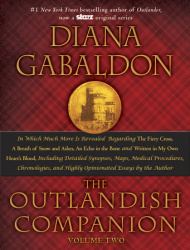 THE OUTLANDISH COMPANION, VOLUME TWO, (aka "OC II") was published on October 27, 2015, a companion guide to my second four OUTLANDER novels: THE FIERY CROSS, A BREATH OF SNOW AND ASHES, AN ECHO IN THE BONE, and WRITTEN IN MY OWN HEART’S BLOOD. It is the second volume to the revised and updated edition of THE OUTLANDISH COMPANION, VOLUME ONE, published in March, 2015. Would you like an autographed copy? You may order this book signed by me from the Poisoned Pen bookstore (listed in the hardcover pull-down menu at left). They ship around the world. More information on signed copies of my books from the Pen. A complete listing of all novels, novellas and short stories, including the eight (so far) novels of the main series, the three (so far) novels of the Lord John series, and quite a few novellas, which deal with various lacunae in the main novels, secondary characters, and anything else it struck me to write about. This is a big chunk, as it includes all the characters from the second four novels and from the Lord John books, with brief notes as to which book each character is introduced in, who they are, and whether they’re fictional or real historical persons. "Don’t You Think That’s a Little Rapey?" [Section 7: The OUTLANDER Family Tree]? "A Brief Footnote on Tidiness"
Similar to the one in OC I – i.e., broken down into relevant categories. More than a decade ago, #1 New York Times bestselling author Diana Gabaldon delighted her legions of fans with THE OUTLANDISH COMPANION, an indispensable guide to all the OUTLANDER books at the time. But that edition was just a taste of things to come. Since that publication, there have been four more OUTLANDER novels, multiple spinoffs, and one smash-hit STARZ original (TV) series. Now Gabaldon serves up THE OUTLANDISH COMPANION, VOLUME TWO, an all-new guide to the latest books and the strange, sprawling world that Claire Randall and Jamie Fraser call home. Each time a new book by Diana is published, readers in different countries around the world would like to know when it will be available in their publication area. Diana announces release dates in each country or publishing region as soon as she knows them. Publishers in Canada, the U.K., Australia, and New Zealand usually release her new books near the publication date in the U.S. If you live in another area, these general guidelines may help. Or contact a local independent bookseller in your area. Note that translation of her books from English to another language before publication usually takes about a year. Notes: The preliminary table of contents listed here was first posted by Diana on her Facebook page on February 19, 2015. The publisher’s synopsis of this book listed here was obtained and added on February 2, 2015. This page last updated by Diana’s Webmistress on Saturday, December 5, 2015 at 1:48 a.m. (PT).